Cocktails like margaritas, mojitos and mint juleps may rule summer, but it's this cocktail hat has captured our attention at the moment. It's the kind of drink that makes you appreciate what goes into making a truly great cocktail--a drink that's an amazing blend of quality components that somehow transcends the qualities of its ingredients to become distinctive in its own right. I'm talking about Mayahuel's Six Shooter, currently our favorite cocktail. We first enjoyed this drink when we visited Mayahuel in December, and had it again when we were there last month. The drink is so good, we actually ordered it twice both of those times. Given our love of this drink, I really wanted to make it at home. Mayahuel has shared many of its cocktail recipes with various print and online publications, I've yet to see a printed recipe for the Six Shooter. If I was going to enjoy this drink at home, I'd have to come up with a recipe myself. What an exciting challenge! Let's start with the basics of what a Six Shooter is. One of Mayahuel's greatest strengths is that its mezcal cocktails are not just a bunch of margarita variants. The bar really puts efforts into exploring all the wonderful ways that mezcal can be enjoyed apart from mixing it with lime and orange liqueur (although, admittedly, mezcal does make a really good margarita). The Six Shooter is a potent drink. It's mostly all liquor. 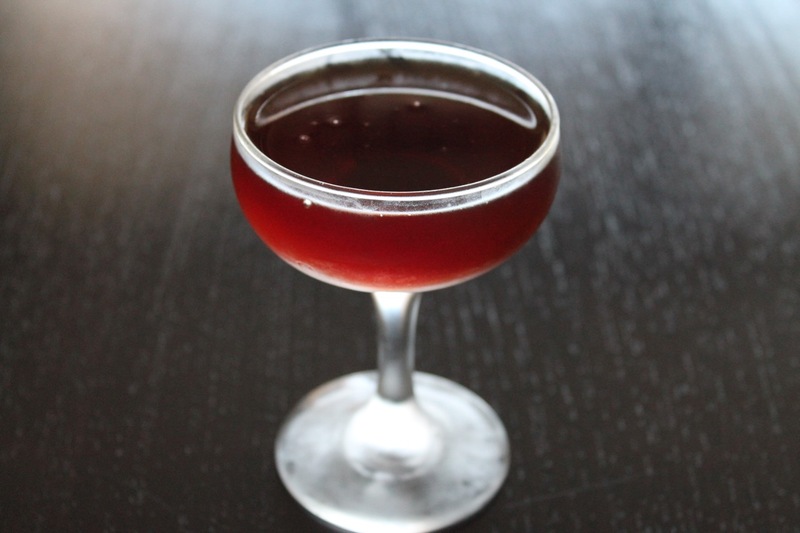 In fact, it's not too dissimilar from a Manhattan, which has been our drink of choice the last couple years. The Six Shooter is mostly spirits with some sweet modifiers, bitters and a few other flavors. Taking a page from the Manhattan, I thought it would make sense to balance the spirits and sweet modifiers at a 2-to-1 ratio. Unlike a Manhattan, the drink has a lot of ingredients. It's base is split between mezcal and rum, with the latter comprised of a South American rum and a Jamaican rum. Mayahuel's Jamaican rum of choice is Smith & Cross, but I couldn't find that, so instead I use Appleton Estate Jamaican rum. Smith & Cross is a navy-strength rum clocking in at 114 proof; in contrast, Appleton is only 80 proof, so this does power it down a bit, but there's so much booze here that it's still a pretty stiff drink. The South American rum is El Dorado 12-Year-Old Rum made in Guyana, which I had no trouble finding. For the mezcal, I went with Del Maguey Vida, a solid mezcal for cocktail mixing. The sweet modifiers are also split between a sweet vermouth, specifically Punt e Mes, which a more bitter than typical sweet vermouth, and Ramazzotti, an Italian amaro that is also bitter and sweet, although nothing like a sweet vermouth. It's one of those European liqueurs that has been around for centuries with a secret, carefully guarded recipe. The other flavors of the drink help round it out, including the classic additions of Angostura (itself a Caribbean product) and orange bitters. The last ingredients is the most mysterious: "cold brew demurara" according to Mayahuel's menu. What could that be? "Cold-brew" probably refers to cold-brewed coffee, which is coffee steeped overnight with cold water rather than quickly with hot water. Cold-brew coffee has been a fad lately. Last fall, Eater published a story about where to find cocktails made with cold-brew coffee, which included The NoMad's drink, The Gentlemen's Exchange, a wonderful whiskey cocktail with a number of bitter and sweet ingredients not unlike the Six Shooter (we tried to drink when we visited The NoMad and it's also really good). A touch of bitter depth from coffee is perfect in this drink. As for the "demurara," I assume that's either an intentional or unintentional misspelling of "demerara," a type of light brown sugar. Possibly the cold-brew just has demerara sugar dissolved in it, although I made a separate rich simple syrup with two parts sugar to one part water. The hard part about not having a recipe for a cocktail is the proportions, but setting this up sort of like a Manhattan worked rather well. Without having a real Six Shooter in my hand to compare this to, it's hard to say how exactly like the original drink this is, but I think it comes pretty close and, regardless, it's really quite delicious. If you're a cocktail fanatic like me, I definitely recommend giving this a try, as well as visiting Mayahuel to try the original. Combine all ingredients in a cocktail mixing glass with ice. Stir until very cold then strain into a chilled coupe glass. No garnish. Note 1: to make cold-brewed coffee, combine 1 tbsp. coffee with 1 cup of cold water and stir. Refrigerate and allow to infuse for 24 hours, then fine-strain the coffee to remove the grounds (alternatively, make it in a French press and press the plunger down after 24 hours). Store coffee in the refrigerator up to 2 weeks. Note 2: to make rich demerara syrup, combine 2/3 cup demerara sugar with 1/3 cup water in a microwave safe bowl (a 1-cup Pyrex glass measuring cup is perfect for this). Microwave on high until the mixture steams and the sugar dissolves when stirred, about 2 minutes. Allow to cool then transfer to an appropriate container to store in the refrigerator for up to 4 weeks.